With the start of the first turn of the campaign, I have found myself well away from the parts of Albion I wanted! Having the misfortune of sitting at the wrong end of the table, out of favour with the dice gods, I have started out on the south of the island in what effectively is Portsmouth, next to the Isle of Wights. Ash’s Slaneeshi Demon army will be getting the pasties in and Jon’s Wood Elves look like they’re going to be led by Joey Essex…on a unicorn. No problem, just makes my quest all the more challenging and gives more potential for story building! Placing flags, castles and mines, we made our first moves and being last, I could watch everyone jostle for territory. Jon made a grab for the Great Ogham Stones and I wasn’t going to let the wood pansies take it so easily. Rolling high enough, I got my warband marker across to the ancient ruins to throw down the gauntlet. Despite making a big deal of getting our warbands ready for the first turn, Jon had spent too much time making cool scenery and an awesome map from Might Empires tiles. His leader unpainted, I couldn’t remind the tree huggers why they should run and hide when the Beastmen are about. Instead I played a bonus game against Paul’s Dark Elves (thanks to Nick for it not being just some random battle! ),which ended up a loss at 136 to 76 VPs. Seems like a bit of a difference but it was actually closer; we had a similar number of models left on the board and both our leaders were still standing. The crucial moment came when I was forced to take a leadership test, always a nervy moment with Beastmen. Fail, I lose the game, pass we battle on and Paul gets 50VPs. I passed. To return the favour I had to kill at least one Dark Elf in the following turn and despite passing a primal fury test on a double 1, laying into a single Corsair with 5 attacks from a pair of gors, I fluffed the wound rolls. Those 50VPs eluded me! Still it meant my leader got to finish off the Witch Elves, from which he had survived at least 4 or 5 rounds of combat, only taking one wound in return. 2+ armour save for the win! I survived the ‘always strikes first’ rule well enough, despite generally having no armour and if the Bestigor had been able to land a few blows in combat (one didn’t even make it in, kept tripping over his own hooves! ), I could have got a few solid kills and a few more VPs. All-in-all a fun first battle of the campaign for the Beastmen. Thought I was really going to struggle against the Witches and the Dark Elves high initiative, but in the end did well enough to make it a close game. On the plus side I got an 11 for the leader upgrade, meaning Durghon got +1S or T, a great result for a character that already has a S4, T4 with a 2+ save! Went for the +1S, as it makes killing things all the more easy! The long faced gors stared slack jawed at Ralgur, as he described the warband of Durghon. Grunting incredulously as the centigor rambled on drunkenly. One of the creatures was about to challenge the credibility of the story in the only way beastman knew, when Ralgur downed the remaining alcohol in the skin, then slammed it in the fire making it flare up unexpectedly. 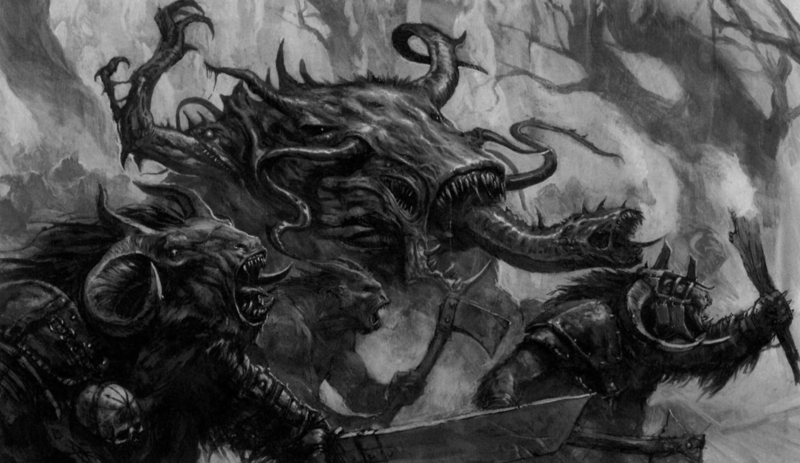 Falling back in surprise and baying angrily, Ralgur laughed loudly whilst the other beastmen nearby ignored the spectacle glad they were not having to put with the centigor’s tall tales. Wiping his face, the tauric beastman leaned forward, the fire casting a red glow under his ugly face making the pair pause and tense, ready for violence. Instead Ralgur began to bawl the story of how Durghon warband took on a band of Dark Elf raiders. Grunting in disbelief they listened at how the beastmen charged across the ancient standing stones from the woods, apparently not far from where they were camped, to drive off the Elven raiders. Most of the story did not sound overly impressive, especially at how drunk Durghon was said to be at the time, which was normal for a centigor. Their ears twitched with interest as Ralgur regailed them with the details of the single combat between Durghon and four Witch Elves. His warhounds slain, the powerful Durghon stabbed, beat and kicked three of the frenzied she-Elves too death. The crazed breeders dancing about him landing too many hits for Ralgur to count, some of them poisoned, but Durghon shrugged them off. Finally, seeing her kin so brutally beaten down, the last Witch Elf fled only to be run down by the victorious centigor. Making sure he emphasised the detail of the demise of each Witch Elf, Ralgur had actually got the gors’ attention. When he finished with the last she-Elf being raised aloft, screaming having slid half way down Durghon’s spear, there was silence. “What happened then?” one of the gors demanded. Ralgur blinked at him, swayed drunkenly, then smiled evilly as he remembered. This entry was posted in Army Blogs, Beastmen, Campaigns, From the Darkness- Liam's Beastmen, The Shrouded Isle, Warhammer Fantasy and tagged beastmen, beasts, bestigor, centigor, chaos, conversion, fantasy, gor, herd, mutants, regiments of renown, warband, warhammer, warhammer fantasy, warhammer painting, warhammer regiments of renown, warhound, whfb. Bookmark the permalink. There are martial arts that are strictly weapons oriented.